Metal Framing -J&f Construction specializes in projects for which cold-formed metal framing and light gage metal framing (interior and exterior) are the basis for all partitions. In this respect we are capable of providing clients the opportunity for creativeness and customization. Weather Barrier- To ensure an air/water tight building skin we also install the sheathing (DensGlass or Plywood). This allows a more efficient installation of Tyveck Commercial wrap or a complete liquid air barrier system comprising of either Henry AirBloc 33MR or 07 and Blueskin SA. Such systems may contribute to LEED points by reducing energy and maintence costs, and the preservation of building components. Insulation- Whether it is for sound (SAFB insulation) or for thermal purposes, we always furnish all necessary insulation within our metal partitions. Additionally, our thermal mechanics also install rigid and semi-rigid insulation board to complement the distinct building designs. Drywall- Analogous with our metal framing partitions, we install gypsum drywall to meet our client's specifications and expectations, providing the opportunity for further customization. J&F Construction furnishes and installs an array of sustainable Gypsum drywall products, manufactured in the US, in an effort to meet the various Green initaitives. 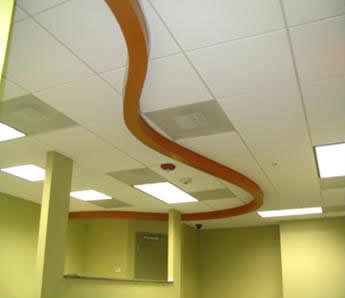 ACT- In order to complete the ceiling operations, we furnish and install an entire acoustical ceiling tile system. Custom and standard acoustical tiles can be provided at any location and designed to meet LEED certifications including products with High-Recycled Content (HRC). Finishing/Painting- Because we strive for excellence in all jobs performed, we do our utmost to complete the metal framing, insulation, and drywall installation to ensure that both the finishing and painting will be of superior quality. Also, our suppliers assist us in providing a wide array of paint types, systems and colors.